Come and join us every week at Fat Pig Farm for a leisurely afternoon on the farm. While sitting at our long table in the farm kitchen, we’ll serve you multiple dishes straight from our gardens and paddock – all seasonal, all grown by hand, and all cooked in our open kitchen while you watch on. Everything possible will be sourced from within the farm itself. It’s an authentic paddock to plate meal – a one-off dining experience like no other. We will celebrate the meal with specially matched beer, wine, cider and spirits from around Tasmania. 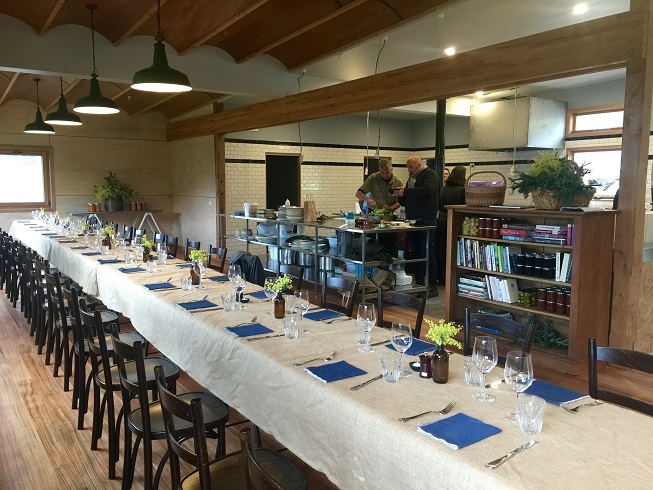 In between courses we’ll take you on a guided tour of the farm. Be prepared for a long lazy afternoon. We start at 12:30 and usually end around 4pm. Friday Feasts are a fixed price of $175, fully inclusive of the leisurely lunch with matching drinks and the the farm tour. You can check out a sample menu to give you an idea of what to expect and scroll down to the red box to book. If you’d like to see what else is on in any given week, check out our handy calendar.